My goal with CatLog was to write the best darned Logcat app for Android, and in that regard I think I succeeded. But as long as the adequate but inferior aLogcat was ahead in the search results for “logcat,” I felt like my work was incomplete. After all, most people will just download the first app in the list without trying any others. How can I really say that I’ve written the “best Logcat app for Android,” when it’s not most people’s first choice? There doesn’t seem to be a big difference in the ratings (4.7 vs. 4.6), and aLogcat has a considerably higher number of downloads and reviews. So what changed? 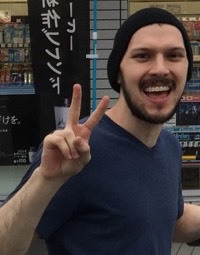 I think this blog post might provide a clue. It seems that, besides downloads and ratings, Google’s ranking algorithm also takes into consideration the retention rate of an app – i.e. how many users actually keep the app installed, as opposed to those who just download it. It’s impossible for me to know what aLogcat’s retention rate is, because Google doesn’t make that information public. But I do know that CatLog has 40,834 downloads and 15,487 active users, which gives it a retention rate of 38%. This is the highest retention rate out of my most popular apps (30% for Chord Reader, 18% for Japanese Name Converter, and 20% for Pokédroid), so I’m guessing it’s also higher than whatever aLogcat has. Considering that aLogcat was released almost a year before CatLog, maybe it initially attracted a large user base that later started flocking to my app? Who knows. Alternatively, it could be the fact that I’ve recently updated CatLog, whereas aLogcat hasn’t been updated since March of 2011. If that’s the case, then aLogcat could quickly regain the lead by just releasing an update. This seems unlikely, though, given that such a system would be easily gameable by just releasing a new update every day. As I noted in a previous post, those kinds of shenanigans made the “Just In” section of the Android Market practically useless, so Google eventually nipped that practice in the bud. Whatever the reason, it’s nice to see that quality apps do eventually drift to the top. Similarly, I’ve watched one of my other apps, KeepScore, jump from 11th to 3rd in a search for “score keeper.” I’m hoping that, by just being the quiet valedictorian in the back of the class, it can eventually make it to the top. CatLog proves that that’s possible. Around that time, I was on vacation in France, and I didn’t have access to a computer with an Android development environment. So when a problem came up in one of my apps, I tried using aLogcat instead. But aLogcat just wasn’t cutting it for me. It was clunky, difficult to read, and lacking in decent search/filter functionality. Just scrolling through the logs to try to pick out my own app from the others was a classic victory of the haystack over the needle. CatLog’s look and feel is inspired by Jeff Sharkey’s Colored Logcat script, which is a great way to view logs because the tags are color-coded, and because everything is organized into neat columns. CatLog is also easier to search than aLogcat, because the search bar is right on top of the screen, and it filters automatically as you type. Despite these shortcomings, aLogcat is still more popular than CatLog, and it comes up first in a search for “logcat”. 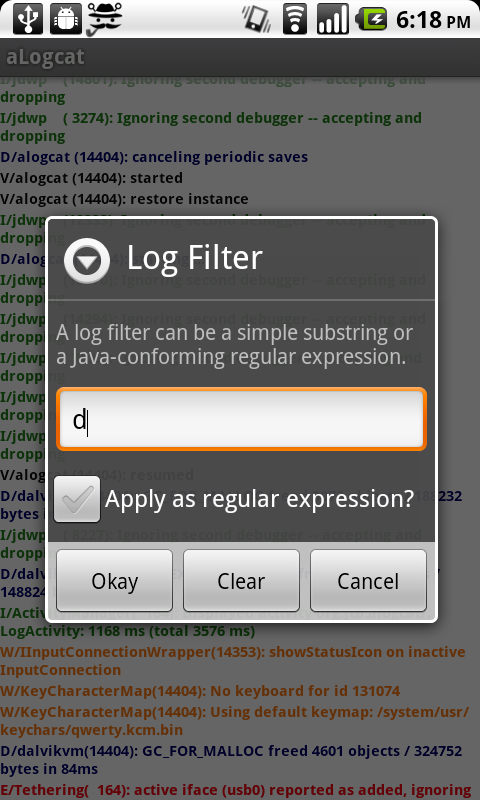 That doesn’t bother me much, though, because I know I’ve written the best Logcat app for Android. You only have to play with each app for a few seconds to see the huge difference in presentation, features, and usability. aLogcat was first on the Android Market, and that’s probably what it owes much of its success to. But given enough time, I’m sure CatLog will pull ahead. I got a little surprise a few weeks ago, though, when I noticed a new Logcat app on the market: LogViewer. I wondered if someone had finally improved upon CatLog – I love a good challenge! But as I played around with the app, I became more and more puzzled. LogViewer has far fewer features than CatLog, but the presentation is a dead-on imitation. Like CatLog, it has a cat in the icon. Like CatLog, it arranges everything in columns. And like CatLog, the search bar is on top of the screen, with “expand” and “clear” buttons to the side. I’m not angry at the developer for taking design cues from CatLog. After all, I modeled CatLog after Jeff Sharkey’s script, and the two look very similar (although his is a Python script and mine is an app). Also, I don’t really believe there’s anything wrong with borrowing someone else’s ideas to improve on them – human civilization is built off of this practice. My only hunch is that, since the author of LogViewer has written an “App Lock”-style app, he’s already had to deal with reading Logcat output (which is the way these sorts of apps work), so he figured he might as well write a Logcat app as well. And if that’s his reasoning, then fine. CatLog is still the best Logcat app on the Market, but if any of my users think to themselves, “Gee, I like CatLog, but I wish it had more ads,” well, they now have another option. I can’t argue against consumer choice, even though this particular choice seems a little silly to me. There is one area, though, where I have to give LogViewer credit: its performance is pretty damn good. When I first tested it out, I noticed that its scrolling was much faster and smoother than CatLog’s. This made me realize that CatLog had some room for improvement in the speed department. So, spurred by this upstart new rival, I went back to the CatLog codebase and made some long-overdue optimizations that brought it up to roughly the same speed as its competitor. These changes are available starting in version 1.1.6. So in this small way, at least, I tip my hat to CatLog’s secret admirer.